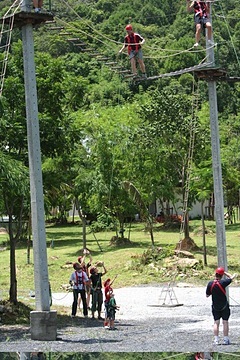 Our challenge course is an experiential adventure program which is intended to invite groups and individuals to participate in a series of tailor made activities which involve the taking of perceived mental, physical and emotional risks. The course is a series of ropes cables and timber platforms designed to provide an individually challenging environment. Safety and cooperation and the development of the individual via achievement are all essential elements and these qualities are emphasized by trained facilitators who guide participants through the course. Our challenge-by-choice approach enables each individual to experience success in the context of their own aspirations. We have found that on the challenge course, the greatest successes are rarely measured in terms of the height climbed or the distance leapt. In a team building adventure everyone has a role to play. Our course consists of two locations, The Aerial elements which are constructed on a network of pre-stressed utility poles and are up to 10m above the ground and our low element course which is only a few inches. All of our high elements are protected by a dynamic belay system controlled by supervising staff from ground level. 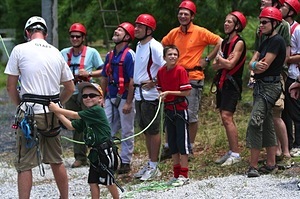 All participants wear a full body harness and helmet. All belay and lifeline ropes used on the challenge courses are dynamic and a full equipment and usage log is kept for all gear and regualr inspections carried out. Below are a selection of elements under the current course configuration. 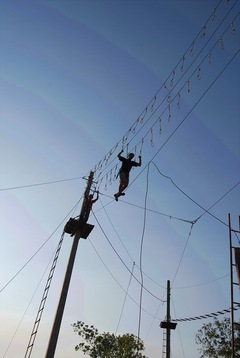 The course is designed so that foot and hand cables can be varied to give a large number of different elements to enable us to tailor the Aerial challenge to the widest range of participants. A steel foot cable with two rope hand rails in a “V” configuration. this is the introduction to the exposure of high elements. A single steel foot cable with a single slightly slack rope hand line. This traverse requires slightly more balance and confidence. Ropes hanging from an overhead cable on either side of the steel foot cable provide the means of balance and support for this traverse. Technique is everything on this element. The most challenging traverse on our course. Etriers are single rung ladders suspended 1 metre apart from an overhead cable. An eight inch teak log, 7 metres long. The task is to walk from one end to the other. Easy when on the ground, but slightly more challenging 4 stories up in the air. A seemingly easy task, simply climb to the top of the 6 metre pole, stand up on the top of the pole and then leap forward to strike the ball hanging a few metres in front. All that is required is complete confidence in your teammates ! In addition to our fixed elements we have an overhead safety cable system that allows us to operate a range of exciting and adventurous stunts. Ranging from “the orange box tower” to the “flying squirrel”. These tasks can be tailored to the requirements of the groups and provide everything from complex problems to flat out exciting. Our purpose built, on-site, low element course is a great training ground encouraging communication and cooperation between participants. Individuals are able to build confidence whilst also developing balance and coordination skills. Each element requires the collective contributions of the team, engendering ideas, support and effort towards a common team goal. The low elements are set in amongst the trees of the lodge area giving a pleasant outdoor environment with the hills of Khao Yai as an ever present backdrop. This element requires the team to devise a way to travel from one side of the “chasm” to the the other using only the planks given to them. No single plank is sufficient to bridge the gap and the solution is not as obvious as it may appear. The team will require patience, planning and cooperation to achieve a successful outcome. Success on this element is based on the groups ability to communicate effectively and exhibit positive group dynamics The task is to move from start to finish along a number of taut cables using a combination of hand ropes and hanging “vines”. Safety and spotting duties are carried out by fellow team members. Further challenge and group interaction can be generated by blindfolding some team members. Standing on a narrow beam the team are told to rearrange the order (e.g tallest at one end, smallest at the other) without touching the ground. Changing places in a limited space without losing balance requires teamwork, concentration and effective levels of communication within the team. The team are given the task of passing each team member though the various shaped holes of the human sized web without coming into contact with a single strand of the web. Once a space is used then the opening is no longer available to the rest of the team. A great deal of trust and “full term” planning is needed for successful completion. 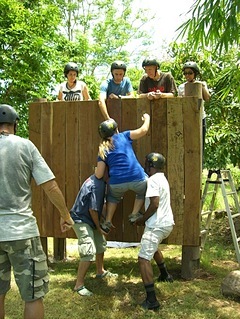 The task is simple, get all the team members up and over the eight foot wooden wall. In order to achieve this objective the team will need to both physically and mentally support each other. This challenge is an excellent opportunity for team members to provide motivation and encouragement to each other. A steel foot cable spaning between a network of columns and two handlines only fastened at a single point in an adjacent tree. The challenge is to move the entire group across the network, passing off handlines from one to another. A 1 inch tape stretched between two columns, the ultimare challenge of balance. Spotted by team members participants will attempt to emulate the great Harry Houdini and other high wire walkers of the past, all be it a few inches from the ground. Whilst the underlying themes of our challnge course are that of personal development, team building and groups dynamics, facilitators will make sure that all challenges are creative, exciting and most importantly - fun. We have a large number of additional challenges that are not listed and our facilitators will work with you to ensure we achieve the right balance of challenges for your group or organization.